(Dec. 14, 2018) The Berlin-Ocean City Jaycees hope to spread holiday cheer for a good cause this Saturday during its free gift wrapping event. 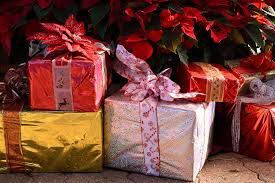 Anyone interested can bring their gifts to Stevenson United Methodist Church on 123 N. Main St. in Berlin, and have them wrapped from 12-5 p.m.
Channel Chaplin, management vice president, said this would be the organization’s first holiday event following the chapter’s reinstatement last December. Chaplin said the organization prides itself on being community oriented through events like holiday gift-wrapping. Chaplin said the entire chapter, which consists of 20 members, is expected to take part in Saturday’s event, and those interested are welcomed to volunteer their time. The organization requests participants donate a new coat – all sizes needed — or a toy in exchange for having gifts wrapped. Chaplin also said the Worcester Youth and Family Counseling Services in Berlin is expected to deliver the items donated to families in need. The Berlin-Ocean City Jaycees is a community driven organization with members ages 18-40 dedicated to positively impacting the area. For more information, visit the “Free Gift Wrapping Event” on the “Berlin-Ocean City Jaycees” Facebook page.